Sometimes the most simple things are the most delicious. 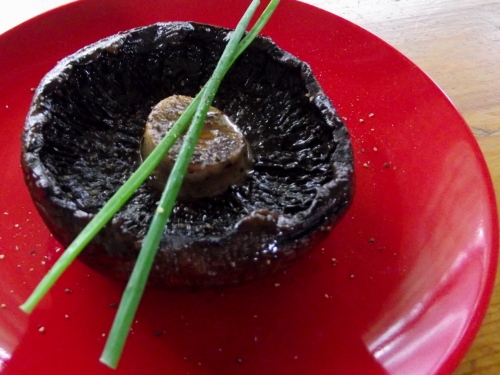 Portobello mushrooms are easily available, large enough to be served as a side dish, and go really well with fat juicy steaks. Wash the mushrooms and trim the stems. Set them stem side up. Mix the oil & balsamic together and gently pour into the mushroom caps, swirling them around so that the whole inside is coated and then season with salt and pepper. Let them sit for 10 or 15 minutes so that it has time to soak in a bit. Pour off excess oil & vinegar and dip mushroom tops in. Grill for 5 minutes per side and serve hot.